This morning Dominion has announced a Voluntary Retirement Program for it's non-union employees. 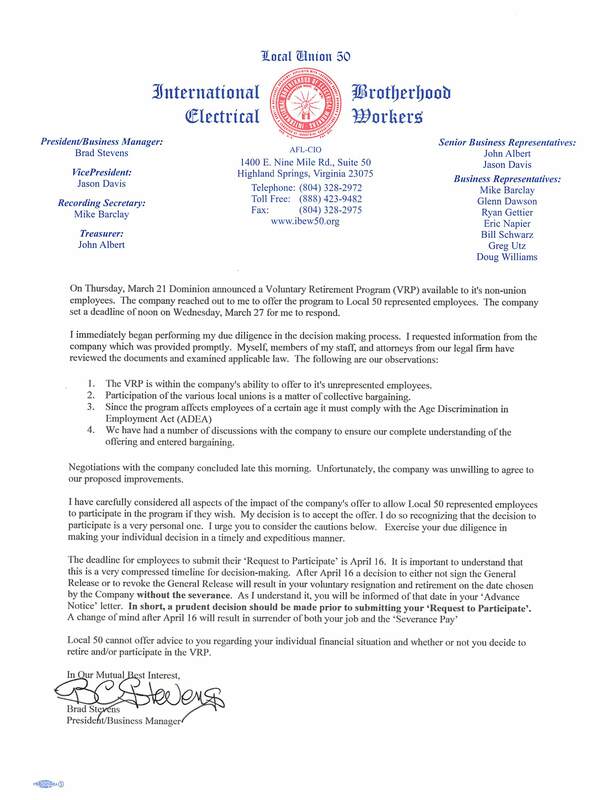 The company has reached out to me regarding Local Union 50 participating in the program. From what I understand from the high level call with the company that the program very closely mimics the Voluntary Separation Package that we participated in during 2010. I requested documentation from the company regarding the program in order to adequately evaluate the program and perform my due diligence in determining our participation in the program. I received that information this morning and have engaged in that exercise of review including, if necessary, legal review. I appreciate your patience during this process and I will communicate my decision to you as soon as possible. President Stevens today announced the addition of Ryan Gettier to his staff ss Business Representative. Ryan is a Substation Electrician in the Portsmouth District and has served the members in a variety ways. He currently serves as Chairman of the Norfolk Unit and Shop Steward, Portsmouth District. Previously, he has served as Chief Steward - Chesapeake Energy Center, Senior Chief Steward - Chesapeake Energy Center, Yorktown Power Station, and Small Combustion Turbine Fleet, and Shop Steward Chesapeake District. In his new role with the Local, Ryan's primary responsibilities will include representative duties throughout, but not limited to Eastern Division. Stevens, while on a conference call with senior staff, said he is "excited to have Ryan join the staff". He went on to say, "Ryan brings an exceptional level of experience to the Local and has worked extremely hard in the representation of our members for years, in all of his roles". 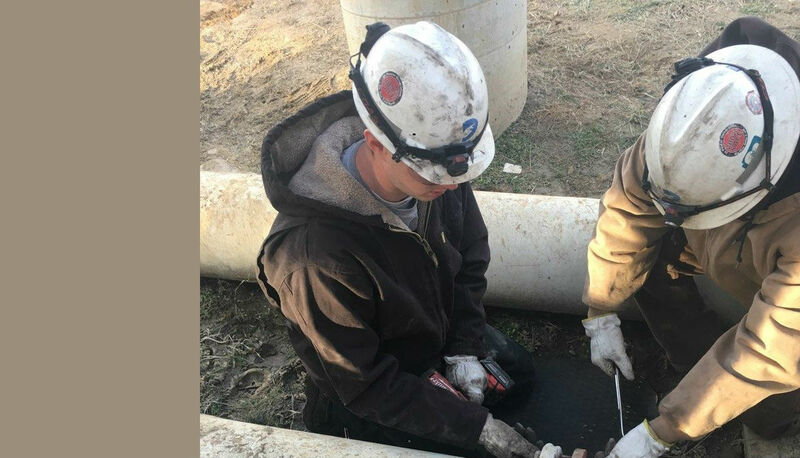 Local Union 50 represents over 3,000 workers in all phases of the generation (gas, coal, hydro, pumped storage, nuclear), transmission, distribution, maintenance, and repair of gas and electric utility systems. We represent workers at Dominion Energy, Monongahela Power, (First Energy), Virginia Natural Gas (Southern Company), and Craig-Botetourt Cooperative. President Stevens has recently announced the addition of two new Assistant Business Representatives, Adam Howlett and Ryan Burtner, to his staff. Adam Howlett is a Mechanic at Chesterfield Power Station and has served the members as Steward and Chief Steward at Chesterfield, and Sr. Chief Steward of Chesterfield, Roanoke Rapids, and Yorktown Power Stations. Adam’s new role will be to assist Business Representative Eric Napier with business at all non-nuclear generation facilities on Dominion Energy property. Ryan Burtner is a Lineman in the Blue Ridge District and has served the members as Chairman of the Bridgewater Unit, Steward at Blue Ridge, and Sr. Chief Steward of Blue Ridge, Augusta Facility (Panel Wiring/Recloser Shop, Substation, and Transmission groups), Rockbridge/Alleghany, and Shenandoah. Ryan’s new role will be to assume a more active role in business at the current locations he services. Local Union 50, International Brotherhood of Electrical Workers represents more than 3,000 employees of Dominion Energy, Virginia Natural Gas, Monongahela Power, and Craig Botetourt Electric Co/op. Members work in all aspects of generation, transmission, distribution, maintenance, and repair of electrical and gas utilities including two nuclear power stations. We have more sad news to announce tonight. Pastor Michael Eugene Tinsley Sr. 60 of Aroda, Madison County, VA passed away Friday, September 7, 2018 in Orange County. Micheal was a Meter Servicer at the Orange Local Office. Micheal was known for his love of sports. Especially UVA women’s basketball where his granddaughter plays. On the job, Micheal or “Kitten” was well liked and known as a source of knowledge and guidance to other employees. He will be greatly missed. Funeral services will be held 12:00 Noon Thursday, September 13, 2018 at Wayland Blue Ridge Center, 15044 Ryland Rd., Rixeyville, VA 22737 with visitation one hour before the service. Also there will be a family visitation from 6 to 8 pm Wednesday evening at Preddy Funeral Home in Madison. The interment will follow the service at Shiloh Baptist Church Cemetery in Woodville, VA.
IBEW Local Union 50 Representatives, Officers and Staff send their sincere condolences to the family, friends and coworkers of Mr. Tinsley. We have sad news to announce tonight. Member Travis Lee Whitley, 29 of Colonial Heights, passed away September 6, 2018. Travis was a Substation Electrician Traniee at the West Broad Local Office. Travis or “Shaggy” was known by his coworkers as being a excellent worker and friend. A colleague shared that Travis came to work eager to learn and with a good attitude everyday. He was proud of the work he performed and had a passion for his job. He will be greatly missed. The family will receive friends from 5 to 7 pm on Wednesday, September 12, 2018, at the Petersburg Chapel of the J.T. Morriss & Son Funeral Home, 103 South Adams Street. Where the funeral service will immediately follow at 7 pm. Condolences may be registered at www.jtmorriss.com. IBEW Local Union 50 Representatives, Officers and Staff send their sincere condolences to the family, friends and coworkers of Mr. Whitley.